The New Orleans Saints fell to the Atlanta Falcons in Week 17 to finish their third straight season at 7-9. And for the second straight season, head coach Sean Payton is at the center of intense speculation. During last season, Payton’s future became a major question mark, with speculation that he could find a new home. However, Payton was given a pretty large contract extension that seemed to keep him in New Orleans for the long term. Once again, Payton’s name has come up in trade rumors after another roller coaster season for New Orleans ultimately ended in disappointment. 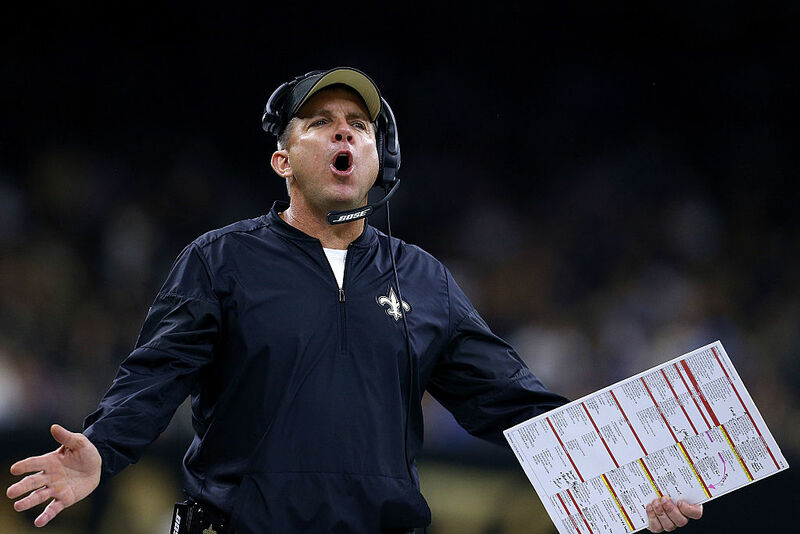 Multiple reports from multiple outlets indicate that Payton and GM Mickey Loomis are discussing his future. Specifically, the Los Angeles Rams have been linked time and again with Payton as they hope to move on from Jeff Fisher. Wouldn’t it be ironic if they made their big splash with someone coming off of three consecutive 7-9 seasons? It’s a sticky situation for both the Saints and for Payton, thus showing the impossible dynamic that comes with being mediocre in the NFL world. Were the Saints back in the playoffs consistently like they were in the first half of the Payton/Brees Era, the contract he signed last offseason would seem like a bargain. Were the Saints bottoming out at 4-12 or 5-11, then it would have been much easier to pull the trigger on a rebuild at any point in the last three years. Instead, the Saints have done neither. They’ve shown enough promise to make fans and the franchise believe that somehow eventually things will turn around and they’ll get those extra 3-4 wins to make them a playoff team once again. But in 2016 especially, the Saints suffered one logic-defying, stomach-churning loss after another. In Week 1 against the Raiders, the Saints blew a 14-point second-half lead at home, losing on a last-minute two-point conversion and missing a 61 yard field goal. In Week 2 against the Giants, the Saints showed some defensive stinginess for one of the few times this season. Alas, they were undone by a blocked field goal returned for a touchdown in a 16-13 loss. In Week 10, with the first chance to get over .500 since 2013, the Saints looked like they could overcome four turnovers. After scoring what appeared to be the go-ahead touchdown in the final minutes, the extra point was blocked and returned for two. Final score: Denver 25, New Orleans 23. It was a confounding season for New Orleans, for sure. The Saints won shootouts against the Chargers (38-35), Panthers (41-38), and Cardinals (48-41). And in the two games their porous defense actually held teams below 20 points, the Saints lost them both. It’s been the same old story for Payton, Brees, and the Saints the last few years. Brees threw for 5,000 yards this year for the fifth time in his career (more than all other QBs in NFL history combined). The Saints ranked first in total offense and second in points per game. They’ve been a top two offense each of the past three years, but their defense hasn’t ranked above 27th. This season, the Saints matched the 2013 Broncos by becoming only the second team in NFL history with a 5,000-yard passer (Brees), two 1,000-yard receivers (Brandin Cooks and Michael Thomas) and a 1,000-yard rusher (Mark Ingram). The 2013 Broncos went 13-3 and made the Super Bowl. The Saints didn’t come close to that level of success. So maybe it’s time for a change of scenery for both Payton and the Saints. Maybe it’s time for a new voice and a new way of doing things in New Orleans. Payton has been the best coach in franchise history, racking up the most wins and winning the franchise’s only Super Bowl. Payton has as many 10-win seasons (five) as the franchise had in all their previous years combined. But at some point after 10 years in charge, it’s time for both team and coach to freshen up. But it’s never really that easy, is it? Look at it from the Saints’ perspective. How many coaches with a Super Bowl winning pedigree are really out there? Not many. So then they would have to sell themselves on finding a young up-and-coming assistant who could theoretically lead them back to the postseason. In other words, they’d let Sean Payton leave in the hopes of finding… the next Sean Payton. Is it really worth the risk to jump on the coaching carousel because they wanted a change of scenery? What if they don’t get it right and become the 49ers or the Jaguars, constantly looking for a new direction? What does a play call between Payton and Brees sound like? And what about Payton? If it really is the Rams that he would be traded to, how much sense does that move make? Nobody with a rational brain would view the Rams as a better situation than the Saints right now. Yes, Jared Goff is much, much younger than Drew Brees, but has he shown that he could be anywhere close to being a franchise quarterback? On the other hand, as long as the Saints have Brees, the Saints will have an offense capable of contending. They also have a hugely impressive young receiving core and a defense that, well, it’s the Saints defense, but at least with Sheldon Rankins and Vonn Bell playing well as rookies, there’s some hope. What about the team around Goff, though? The Rams lost their last seven games this season, including a 49-21 defeat to the Saints and a 44-6 loss to the Cardinals to mercifully end the campaign. Everything about the win-now nature of the NFL says it would be time to try something different after three straight 7-9 seasons. But with the Rams, Payton would be taking on a true rebuilding project. Without Payton, the Saints would likely be doing the same. Unless both of them are truly ready to start over, and take the risk that goes along with it, it might be worth it to make one last go of it together.